The first Growing Community Abundance gathering took place on Sunday 17th March at Devonport Park Activity Centre. More than 25 community growers participated in this networking and skill sharing day. The day included a seed swap with the Stonehouse Seed Bank in pride of place. In addition, Fred of Vital Seeds brought their seeds along and then did a seed saving workshop to encourage people to save seeds from their growing project. Matt from Pollenize brought some wild flowers seeds and shared information about their new project and their plans to put hives at three sites across the city for black bees. The day ended with a guided walk around Mount Wise to see community growing projects and share tips and lessons from the 10 years that Dig for Devonport has been working in the area. There was a great response from the community growers. Jade Ward from Routeways commented “The mapping exercise was really useful in showing what is already happening in the city and linking everyone together. “The gathering was very useful for networking and ‘mapping’ all of the fantastic work that is already going on in the city. 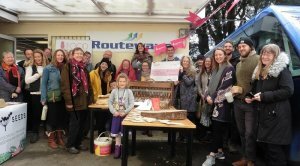 It enabled me to link up with a gardener who is going to volunteer for Routeways, which in turn is going to support the children and young people that we work with. It also allowed me to link up with another project (Pollenize) to offer my time to support them.” The community growers included people from Collins Park Trust, Horticultural Therapy Trust, Edible Whitleigh, Grow Stonehouse, Poole Farm, Delamere Road wildlife Garden, Cattedown Community Waste Garden, Seeds n Feeds, Central Park Allotments, Union Corner, Mount Wise Towers and Snapdragons. There will be more opportunities for community growers to take advantage of these events during 2019. in addition during July many of the Community Garden will hold open days and activities so more people can visit and get involved in these amazing places.